You can back up your messages and media by using Google Drive and restore it again to new Android device. However, please note to back up data is only available between devices based on same OS. 1. Your mobile device must be synced with Google Drive. 3. Your Google Drive account must have enough space for your all WhatsApp data. 4. Your mobile device must have enough free space to create the backup. 4. Tap Chats and calls. 6. Tap on Back up to Google Drive and set up the backup frequency, and then tap Back Up to do an immediate backup. It back up your message and media to GoogleDrive. Please note that backing up over cellular may result in Additional data charges. 2. Tap RESTORE when prompted to do so. Please note that if you don't restore now, you won't be able to restore later. 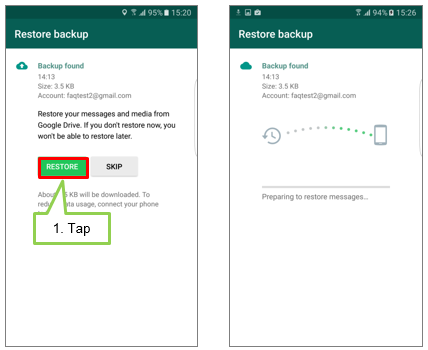 To backup and restore WhatsApp data is not available between devices based on other OS type.